Notes: Rare cover with additional 'The Prince of Wales' Committee' meter mark. The above Royal Mail Prince of Wales Investiture stamps were issued on 01 March 1994 by Royal Mail and feature the following stamp designs: 19p Chirk Castle, Clwyd; 25p Ben Arkle, Sutherland; 30p Mourne Mountains, County Down; 35p Dersingham, Norfolk; 41pDolwyddelan, Gwynedd. 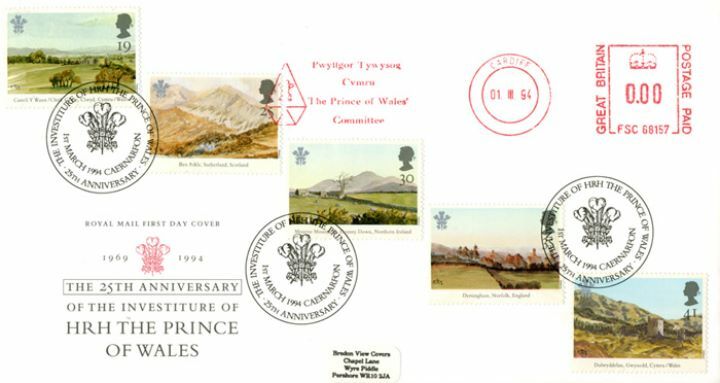 The The Prince of Wales' Committee first day cover with the Caernarfon, Prince of Wales' Feathers, Special Handstamp postmark has been produced by Royal Mail/Post Office and features these stamps which can make a very collectible and lovely gift.